The Langa community comes from the eastern part of Rajasthan, mainly from the districts of Jaisalmer and Barmer in the north-western part of the country. Set a midst the desert, the community has developed a rich and composite culture infused with music and dance. Though Muslim by birth, the Langas are closely linked to generations of both Hindu as well as Muslim patrons called the ‘jajmaans’. During festivals and all special occasions like births, engagements, marriages, etc. the Langas are called upon to perform and sing in homes and temples and are then remunerated for their performances by the patrons. The music of the Langas borders on the classical and they are usually adept at both singing as well as playing their musical instruments, which are the sarangi, the murli (flute), the surnai (big bass flute), the algoza (double flute), the morchang (jewish harp) and the khartal (castanet). We Provide Langa Party Artist (Rajasthani Singer ) For Any Type Of Event Like Business Dinners, Golf Tournaments, Networking Events, Product Launches, Award Ceremonies, Holiday Parties, Customer Appreciation Parties, Board Meetings, Happy Hours, Seminars, Shareholder Meetings, Charity Functions, Press Conferences, Trade Shows, Vip Events, Standard Event, University Event, Youth Event, Salon Event, Corporate Event, Ed Event, Cinema Event, Library Event, Announcement, Audition, Banquet, Campus Activity, Candidate Seminar, Ceremony, Colloquium, Concert, Conference, Deadline, Enrichment, Exam, Exhibition, Festival, Forum, Fundraising, Gathering, Lecture, Meeting, Outreach, Performance, Reading, Reception, Recreation, Regional Activity, Screening, Seminar, Sport, Training Party Planning, Promotions Events Management, Corporate Event Organizer, Leisure Event Management, Personal Event Management,Wedding Event In All Over India. Gallery The Langha and related Manganiar are both communities of folk musicians, and have two sub-divisions, the Sonia Langha and Sarengia Langha. These sub-divisions are based on the use of musical instruments used, the Sonia Langha play the shanai (a type of piped instrument) at wedding ceremonies, and the Sarengia play the sarangee. The two groups are endogamous, and are further divided into clans. The community sing, play music and entertain the Sindhi-Sipahi, a community of Muslim Rajputs, who act as their jajmans (patrons). They are found in the districts of Barmer, Jaisalmer and Jodhpur, and speak Marwari. The community are endogamous and practice clan exogamy. Their main clans are Khaltera, Pannu, Janjarika, Kalrika and Toarika. At times of birth, marriage or any family festivity of their Sindhi-Sipahi patrons, the Langha musicians are in attendance to evoke the right mood with songs of the desert and many specially composed songs to praise the patron and his family. During the last fifteen years, many Langha have become part of the entertainment industry, and have toured the world as part of the “Festival of India” tours organized by the Indian government. We Provide Langa Party Artist (Rajasthani Singer ) For Any Type Of Wedding Event In All Over India.We also provide Rajasthani folk music singers, dancer, lok dance artist booking services in all over india.Rajasthani Langa Songs Jugalbandi, Fire Shows, Puppet Shows, Wedding, Camel Elephant Horse Riding, Welcome Girls, Mehandi Girls, Caricature, Rice Painting, Magic Shows, DJ Services Semi classical Like kawali, Gazals. Manganiar are professional hereditary caste musicians. They mostly live in Jaisalmer and Barmer districts of Rajasthan.They play an interesting string instrument played with a bow. It is know as Kamaicha. The instrument is exclusively played in Rajasthan and some other parts of Sindh in Pakistan. Manganiars (Though Muslims) sing invariable among Hindu patron families. They serve during childbirth, weddings and other ceremonies. Manganiars are very good are rhythmic instruments like Dholak and Khadtal. Their musical compositions are very complex and have improvisatory rules build into it. Virtuoso rhythm playing has largely added to their success in music. Manganiars have performed in many countries of the world. They have achieved great success everywhere. The Langas and Manganiars are groups of hereditary professional musicians, whose music has been supported by wealthy landlords and aristocrats for generations. Both sing in the same dialect, but their styles and repertoires differ, shaped by the tastes of their patrons. The monarchs of the courts of Rajput and Jaipur maintained large music and dance troupes an in an environment where the arts were allowed to flourish. Though both communities are made up of Muslim musicians, many of their songs are in praise of Hindu deities and celebrate Hindu festivals such as Diwali and Holi. The Manganiar performers traditionally invoke the Hindu God Krishna and seek his blessings before beginning their recital. At one time, the Manganiars were musicians of the Rajput courts, accompanying their chiefs to war and providing them with entertainment before and after the battles and in the event of his death, would perform at the ruler’s vigil day and night until the mourning was over. Langa literally means ‘song giver’. An accomplished group of poets, singers, and musicians from the Barmer district of Rajasthan, the Langas seem to have converted from Hinduism to Islam in the 17th century. Traditionally, Sufi influences prevented them from using percussion instruments, however, the Langas are versatile players of the Sindhi Sarangi and the Algoza (double flute), which accompany and echo their formidable and magical voices. They perform at events like births, and weddings, exclusively for their patrons (Yajman), who are cattle breeders, farmers, and landowners. The Langa musicians are regarded by their patrons as ‘kings’. “The ‘Sindhi Sarangi’ used by the Langas, is made up of four main wires, with more than twenty vibrating sympathetic strings which help to create its distinctive haunting tones. The bowing of these instruments is a skilful exercise, often supported by the sound of the ‘ghungroos’ or ankle bells that are tied to the bow to make the beat more prominent. The word ‘Manganiyar’ means those who ask for alms. On different occasions they would go to patron’s houses and sing appropriate songs and in turn would be rewarded. The Manganiyar community is divided into two parts, one whose patrons are Hindus and the other who have Muslim patrons. The Hindu patrons mostly belong to Bhati and Rathore communities of Rajputs while the Muslim patrons are Sindhi Muslims. Even though the Manganiyars are Sunni Muslims by birth, their lifestyle and the way of dressing up reflect the Hindu or the ‘Ganga-Jamana’ culture. They present a perfect example of communal bonhomie as for generations they have been closely linked to both Muslim and Hindu families for their livelihood. Since generations the tradition of singing and composing for occasions is going strong. Singing at their jajmaans house on various occasions is their traditional profession. Describing their jajmaans illustrious history which is full of honor and pride, is their specialty. The description of jajmaan’s Genealogy with the support of artists is known as ‘Shubhraj’. Such is the ability of these people that they could recite all the names of the last few generations of the jajmaans within the space of a single breath. This also includes the description of their achievements. In exchange of the above, the manganiyars were rewarded handsomely in the form of grain, wheat, goat, camel, sheep, horse or cash. Khamaycha is the most significant instrument of Manganiyar community. It is like an ancient niche amongst string instruments which is linked with Manganiyar community since ages. Khamaycha is made up of mango wood. The big, round, hollow part on one end of it is covered with goat skin. This instrument has 17 strings out of which three special strings are made from goat’s intestine and the rest of the 14 strings are made up of steel. When they touch those three special strings with their special bow made from the horse’s hair, it produces some soul stirring music. Other than Khamaycha the instruments that they play are Dholak and Khartaal. Dholak is a hollow drum tapering at both ends. Both the ends are covered with leather (animal skin). They use loops of rope to tighten the animal skin at the two ends. Sometimes they use traditional Dhol also. Khartaal produces melodious musical sounds with the special movements of the hands. The four pieces of Khartaal are made up of Sheesham wood. When the Manganiyar artist plays Khartaal, it evokes a delightful combination of rhythm and the musical notes. Khartaal. The word mean Khar and Taal. Khar means hand and Taal means Rhythm. Rhythm of Hands. Khartaal is a kind of castanets, made of teak wood, and the artistes hold them in both hands and perform with tremendous ease. A young man’s Karthal play holding it in his hands was a thrill to watch for the way he created complex percussion sounds, while his partner was playing the dholak. The dholak is a classical North Indian, Pakisthani and Nepalese hand drum. A dholak may have traditional lacing or turnbuckle tuning. The dholak has a simple membrane and a handle on the right-hand side. The left-hand membrane has a special coating on the inner surface. This coating is a mixture of tar, clay and sand (dholak masala) which lowers the pitch and provides a well-defined tone. The wood used for the membrane is usually made of teak wood, also known as “sheesham” wood. The process of hollowing out the drum is the determination of the sound and quality of the dholak A dholak has 2 heads a small part for the high pitch, and the large part is for the low pitch and it’s pitched depending on size and tuning sounding like a bongo in playing mode. The vast unending expanse of burning hot sand that makes up the Thar Desert of Rajasthan hosts one of the most vibrant and evocative music cultures of the world. The heady, hypnotic combination of rhythm and melodies sung and played by the Langas and Manganiars are part of the eternal appeal of this mysterious and wondrous land. The soulful, full throated voices of these two music communities have filled the cool air of the desert night for centuries in a tradition that reflects all aspects of Rajasthani life. Songs for every occasion, mood and moment; stories of legendary battles, heroes and lovers engender a spirit of identity, expressed through music that provides relief from the inhospitable land of heat and dust storms. Ismail Khan Langa and his group are of the Langa caste and their ancestral village is Badnava in Barmer District of Rajasthan. Traditionally their ancestors, professional musicians, were invited by the royal families to perform at weddings, childbirths or other festive occasions. Over the years there has been an increasing trend of groups performing at programs nationally and internationally and that is how these groups make a living now. Rajasthan’s Langa DanceTheir entire team consists of members of the family, uncles, cousins, brothers, nephews; all men. The women were not allowed to perform traditionally and still are not. The women who are part of their team are professionals of other communities who team up with them to provide variety to the repertoire at programs. Their group has travelled abroad to perform at several programmes. The Langas and Manganiars are groups of hereditary professional musicians, whose music has been supported by wealthy landlords and aristocrats for generations. Both sing in the same dialect, but their styles and repertoires differ, shaped by the tastes of their patrons. The monarchs of the courts of Rajput and Jaipur maintained large music and dance troupes an in an environment where the arts were allowed to flourish. Though both communities are made up of Muslim musicians, many of their songs are in praise of Hindu deities and celebrate Hindu festivals such as Diwali and Holi. The Manganiar performers traditionally invoke the Hindu God Krishna and seek his blessings before beginning their recital. At one time, the Manganiars were musicians of the Rajput courts, accompanying their chiefs to war and providing them with entertainment before and after the battles and in the event of his death, would perform at the ruler’s vigil day and night until the mourning was over. Rajasthan’s Langa DanceLanga literally means ‘song giver’. An accomplished group of poets, singers, and musicians from the Barmer district of Rajasthan, the Langas seem to have converted from Hinduism to Islam in the 17th century. Traditionally, Sufi influences prevented them from using percussion instruments, however, the Langas are versatile players of the Sindhi Sarangi and the Algoza (double flute), which accompany and echo their formidable and magical voices. They perform at events like births, and weddings, exclusively for their patrons (Yajman), who are cattle breeders, farmers, and landowners. The Langa musicians are regarded by their patrons as ‘kings’. The ‘Sindhi Sarangi’ used by the Langas, is made up of four main wires, with more than twenty vibrating sympathetic strings which help to create its distinctive haunting tones. The bowing of these instruments is a skilful exercise, often supported by the sound of the ‘ghungroos’ or ankle bells that are tied to the bow to make the beat more prominent. Another remarkable bowed instrument is the ‘kamayacha’ of the manganiars with its big, circular resonator, giving out an impressive deep, booming sound. The music of Rajasthan is driven by pulsating rhythms created by an array of percussion instruments, the most popular of them being the ‘dholak’, a double headed barrel drum, whose repertoire has influenced other Indian drums including the tabla. This recording also features the double flute, ‘satara’, and the hypnotic Jewish harp or ‘morchang’. 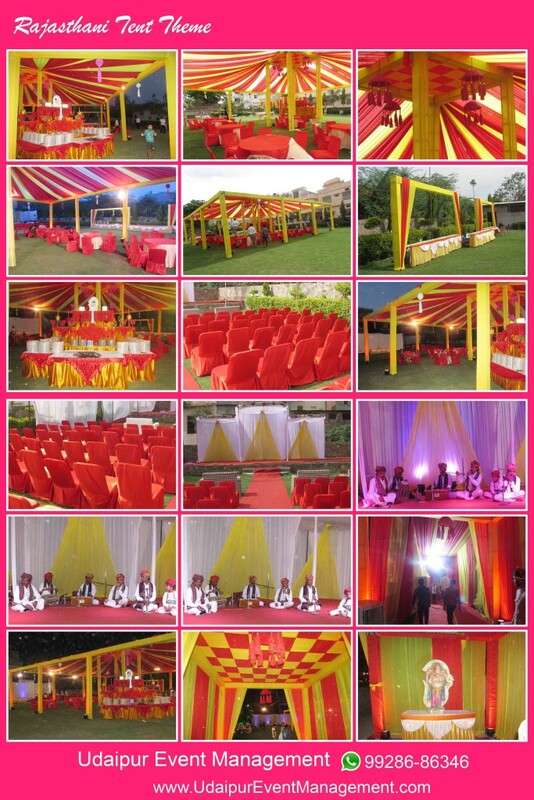 Udaipur Event Management Company is a unique dedicated Udaipur – ‘Where Orchestra and Folk Music and Folk Dance find their appropriate position and place’. The Complete Combination which gives you a 100% listening pleasure and comfort to the ears & Soul. Udaipur Event management Company caters to all the areas of orchestral music, Vocal music, live classical music, light music instrumental, Kathak Dance, Rajasthani Folk Dance Like ( Bhawai, chari, Ghoomer, Gramin Bhawai, Kalbeliya) , Rajasthani Langa Songs Jugalbandi, Fire Shows, Puppet Shows, Wedding, Camel Elephant Horse Riding, Welcome Girls, Mehandi Girls, Caricature, Rice Painting, Majic Shows, DJ Services Semi classical Like kawali, Gajals and either independently or combined in a symphony orchestra format presenting thereby with a wonderful blend of good sound.They provide you with a treat of best music- best classical music, best Instrumental Music, Best Vocal Music, Best Folk Dances Of Real Rajasthan that is quite Much ancient.